Summer beach visitors once settled for bikes and pedal power if they wanted to do some island touring on wheels. At Oak Island the choices have grown way beyond that. They can now zip around in rental motorized vehicles including “scoot coupes” and Segway personal transporters. 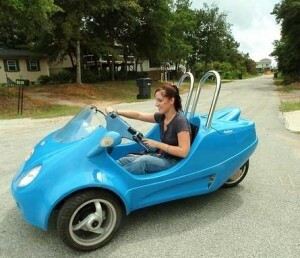 Oak Island Rentals, at 5319 E. Oak Island Drive, offers a variety of rentals, bright red or blue scoot coupes among them. This two-seater veh icle will hold up to 400 pounds. Powered by a 49cc motor, it gets about 65 miles per gallon and is subject to the same laws that govern motor scooters. They cruise at 30 mph, but turns should be made at 10 miles per hour, said Andrew Travis at Oak Island Rentals. Safety features include roll bars and seat belts. And child safety seats can be used. rent for $50 an hour or $85 for two hours. Travis said regular scooters, which are from China and Taiwan, offer better mileage. “The scooters also have a 49cc motor, but they get almost 100 miles per gallon,” he said. Both the scoot coupe and the scooters require that the driver have a valid driver’s license. The scooters rent for $50 for four hours or $85 for 24 hours. Oak Island Rentals also offers golf carts and bicycles including tandem bikes, 3-wheeled bikes and baby seats. If you would rather see the island from the water, Travis has surf boards for rent. Segways by the Sea, at 8810 E. Oak Island Drive, offers a two-wheeled personal transporter. Bob and Carolyn Pirnat opened Segways by the Sea in mid-June. “We’ve had a surprising response,” Bob says.